This edition will be a resource of tremendous value. The book penetrates the fast food industry’s mystique and empowers you by revealing, in layman’s terms, the techniques for valuing these businesses and their assets. No other book on the market covers all of these issues in one source. It is packed with spreadsheets, examples, forms and checklists which really work. The knowledge you will gain from this book is powerful and explains important terms and concepts clearly. This book is the only one of its kind with an in depth overview of the valuation of fast food and fast casual operations. Chapter 1 (Overview of the Fast Food and Restaurant Industry) provides a comprehensive overview of the fast food and fast casual segments of the restaurant industry and the rapid changes which are taking place. This chapter focuses on the history, operations, competitive landscape, main players, risks, trends, and regulatory environment of the industry. Chapter 2 (Analyzing a Quick Service Restaurant’s Financial Statements and Operations) provides a primer on basic financial statement ratio analysis and an overview of adjustments for extraordinary and nonrecurring items. Although these adjustments are not as critical for larger businesses, they are crucial for understanding and valuing closely held businesses. Chapter 3 (Summary of Business Valuation Approaches) presents a summary of the various approaches to valuing a business. More importantly, it presents an overview of which valuation technique is most useful, when comparing the values during a reconciliation. 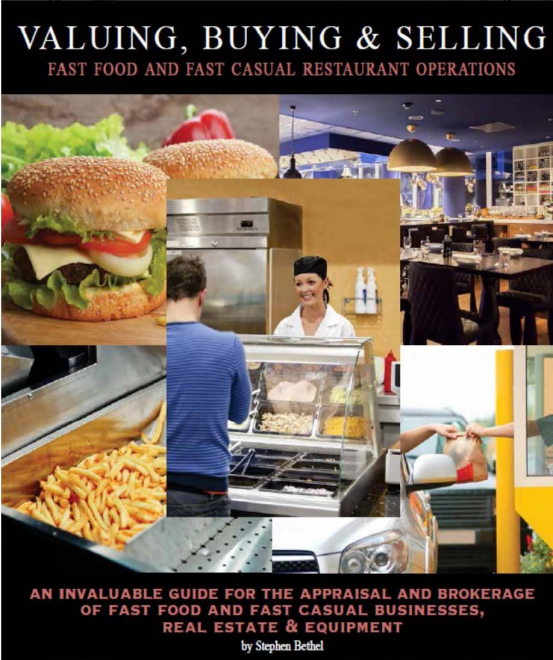 Chapter 4 (Business Valuation: Quick Service Restaurants) looks at different methods of valuing a fast food business. Chapter 5 (Asset Valuation for Quick Service Restaurants: Real Estate): Real estate may sometimes constitute the largest component within the fixed asset category on a balance sheet. This chapter gives a critical primer in what to look for when accounting for the real estate asset or lease, as part of a restaurant business acquisition or valuation. It also addresses the different types of fast food restaurants, leases, and typical methods of valuing the assets. Chapter 6 (Quick Service Restaurant Asset Valuation: Equipment) Every business is sold with equipment. However, knowing how much the machinery and equipment are worth will assist the purchaser in determining the amount of goodwill that a buyer would pay for as part of the overall purchase price. After understanding this chapter, you will be able to notice how a balance sheet can change radically, based upon the definition of value, as well as to be able to calculate the differences in equipment values. Chapter 7 (Selling and Buying a Business: Intro) This chapter deals with purchase offers for a business, brokers, and the motivations of both buyers and sellers. Most sellers have no knowledge of the relationship between cash flow and value. On the other hand buyers pay for the history of the company and not the potential or proforma income. Chapter 8 (Buyer/Seller Due Diligence) Here you will learn the deceptions which sellers use to increase the earnings of a business. Due diligence by a buyer is time well spent. The chapter also provides a great overview of a seller s due diligence on a buyer. Chapter 9 (Selling a Business: Terms and Financing) Terms of an agreement and financing resources can make or break a deal for most closely held businesses. Since most small businesses sell with seller financing, the terms and financing are intricately related. This chapter focuses on the basics of negotiating and structuring seller financing. In addition, it shows the nuts and bolts of the feasibility of the purchase price as it relates to the new debt burden which will be incurred after the transaction. Most importantly, the chapter provides sanity checks against rules of thumb. Chapter 10 (Selling a Business: Asset vs. Stock Sale) This chapter describes the impact of a stock versus an asset sale on the purchase price. While contingent liabilities are a factor, the preference of both the buyer and seller is almost always based upon tax ramifications. It also describes the mechanics of a purchase price allocation for tax purposes. Chapter 11 (Selling a Business: Finishing Steps) is critical for Asset and Stock Sales.